Little did we know that the early taste of summer that sent temperatures soaring into 70s on April Fools' Day was but a cruel trick from Mother Nature. There were many sleepless nights for growers who were on frost watch for much of last month. 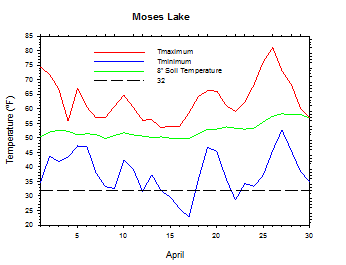 In fact, during an impressive stretch from April 8th to 24th, Moxee recorded sub-freezing low temperatures on 15 of 17 days, including 8 consecutive frost mornings from April 11 to 18. Even so, mean April temperatures were actually slightly above normal in central Washington, which highlights the critical role of both averages and extremes in describing and understanding the climate. The large day to day variability last month was characterized by frosty lows and summer-like highs, as well as wind, rain, and sunshine. 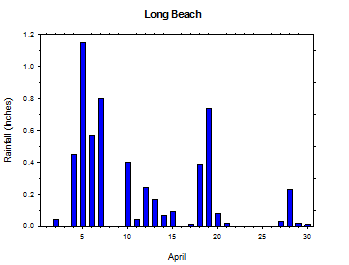 Following the warm and dry start to the month, wet weather from April 4 to 7 brought nearly 3 inches of rain to Long Beach during the brief four day period. Despite rain-cooled days, mild lows resulted from the cloudy and moist weather. A strong storm slammed into Washington late on April 12th, bringing rain, mountain snow, and wind to the region, with gusts up to 66 mph at Wenatchee Heights. Behind the system, a cool and unsettled air mass arrived and persisted for most of the middle of April. Later in the month, Washington enjoyed the warmest weather of 2013. The temperature rose to 77 degrees at Vancouver on April 26th, while Desert Aire climbed to 86 degrees, which remains the warmest temperature recorded by AgWeatherNet since last September 29th! However, a potent weather system crossed Washington on April 29th, bringing rainfall to western areas, 50 mph winds to eastern Washington, mountain snow, and much cooler temperatures. Low temperatures on the 30th dropped as low as 22°F at Ritzville, as highs were capped mostly in the 50s or lower statewide. The warm weather on April Fools Day was no joke, as temperatures soared to near 80 degrees in parts of eastern Washington. Even low temperatures were as warm as 54°F at Wahluke Slope. Sunny and dry conditions continued on April 2nd, thanks to a strong ridge of high pressure that sent highs into the 70s once again. However, a more typical spring-time pattern emerged on April 4th, as clouds increased ahead of an incoming weather system being driven toward Washington by a strengthening Pacific jet stream. Although many areas experienced light rain, a few locations were affected by thundershowers and heavier rainfall, including 0.36 inches at Pullman. Rain-cooled highs dropped into the 50s and 60s in many places, while clouds and southerly flow caused balmy low temperatures. On April 5th, the low temperature dropped to only 51°F at Moxee. The weather became cooler and windier on the 6th, following a cold frontal passage. Rainfall occurred across the state on the morning of April 7th, with storm totals of around one-quarter inch in the Yakima area, and 1.37 inches at Long Beach. Later in the day, showers in the south decreased as windy conditions returned. Rain spread northward later in the day, with a daily total of 0.6 inches at Omak causing a chilly high of only 47°F. With the arrival of cooler air, several inches of snow fell in the higher elevations of the Cascades around Mt. Rainier. Overall, April 4th to 7th was a rather wet period in western Washington, with four day rain totals of nearly 3 inches at Long Beach. April 8th was cloudy and cool but somewhat drier, as temperatures generally topped out in the 50s, except upper 40s in the east. Lows were as cold as 26°F at Ritzville and 30°F at Moxee on the 8th, and 27°F at Broadview on April 9th. April 9th represented a brief but dry respite from the active weather, as high temperatures warmed into the low to mid 60s under mostly sunny skies. A mild storm plowed through Washington on the 10th, as winds gusted to 52 mph at Huntsville, with sustained winds peaking at 43 mph. Highs warmed to 71°F at the Tri-Cities, while 0.58 inches of rain fell at Lawrence, northeast of Bellingham. 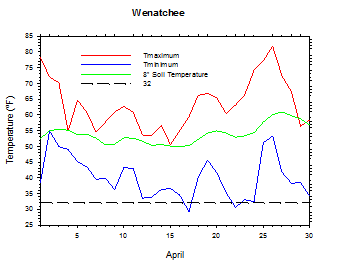 More stable weather brought isolated cold temperatures to central and eastern Washington on the morning of April 12th during the critical bloom period. Low temperatures dropped to 22°F at Ritzville and 25°F at Moxee. A strong storm pummeled the region beginning late on April 12th, bringing rain, mountain snow, and windy conditions. Much cooler air arrived on April 13th, although morning temperatures were mostly above freezing thanks to the wind. Still, cold places like Moxee dropped to 27°F. Highs rose only into the 40s in places like Cowiche in the upper Yakima Valley. Winds gusted as high as 66 mph at Wenatchee Heights. An unstable and moist air mass lingered over the state on April 14th, and cool daytime highs and scattered showers were observed, even in central Washington. Temperatures on the morning of the 14th dropped to 22°F at Moxee, as growers were forced to employ a variety of frost protection techniques. Although clouds and instability kept temperatures a bit warmer on the morning of April 15th, lows still dropped into the mid 20s in colder areas. Cool days on April 15th and 16th saw highs as low as the mid 40s in eastern Washington. Lows on April 16th dropped as low as 24°F at Moxee, while the 17th recorded lows as cold as 19°F at LaCrosse and 21°F at Moxee. Even on the 18th, a few low temperatures fell below freezing, with readings as cold as 24°F at LaCrosse. Warmer weather in the 60s arrived on the afternoon of April 18th, as more seasonal conditions returned. A storm dropped through the northwesterly flow over Washington to bring rain to western Washington on April 18th, and windy conditions east of the Cascades on the 19th. Slightly unsettled conditions continued over the weekend, with wind in central Washington and showers in western Washington on April 20th. Frost occurred yet again during the transition period from cool and unsettled to warm and dry weather. A few locations were below freezing on the morning of April 21st, as temperatures rebounded into the 60s in central areas, but only to around 50°F in eastern Washington. 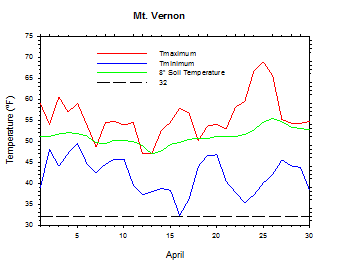 Clear skies made for a cold morning on April 22nd, with lows as cold as 24°F at Broadview and 26°F at Harrington South, and highs ranged from 49°F at Pullman to 66°F at Vancouver. A ridge off the coast provided mainly dry and calm conditions over the area, as weak disturbances periodically brushed Washington under the northerly flow. Lows on April 23rd were as cold as 24°F at Hundred Circles and Moxee. Despite a cold morning on the 23rd, sunshine allowed for increasingly warm day-time weather, with widespread 60s. Lows began to moderate on April 24th, although Ritzville still dropped to a chilly 25°F. Above freezing lows were observed state wide by April 25th. The warmest period of the year occurred from April 24th to 26th. 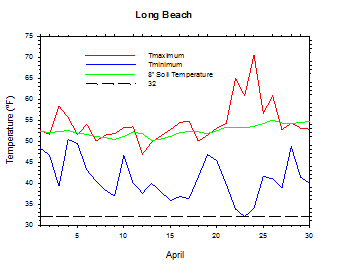 In western Washington, temperatures reached 71°F at Long Beach on April 24th and 77°F at Vancouver on the 26th. However, day-time cooling quickly came to northwestern Washington with the return of onshore flow on the 25th, even as heat continued east of the Cascades. The high of 86°F at Desert Aire on April 26th was the warmest AWN temperature since last September 29th! However, cooling day time temperatures arrived at all areas on April 28th, as a weak system crossed the Northwest. Breezy winds dominated for the rest of the month, with sustained winds of over 40 mph, and gusts as high as 52 mph at Huntsville on April 27th and 29th. A strong storm barreled through the state on April 29th, leading to windy conditions and blowing dust, as well as some west side rainfall and mountain snowfall. Following the mild morning temperatures, many locations saw minimal warming during the day, which is very unusual for this time of year. Temperatures were below normal to end the month, with lows on April 30th as cold as 22°F at Ritzville and 27°F at Moxee, and highs struggling to reach into the 50s and 60s. 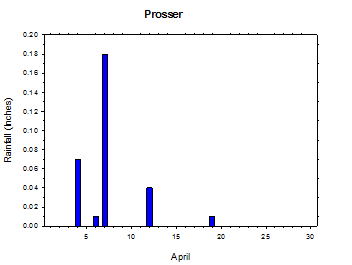 The average April temperature at Prosser (WSU IAREC) was 52.3°F, which is 0.6 degrees above average. The average high temperature was 64.1°F, which is 0.6 degrees above average. The average low temperature was 39.1°F, which is 0.5 degrees above average. The maximum temperature recorded last month was 82.3°F on April 26th, while the coolest daily high was 52.9°F on April 15th. Low temperatures ranged from 51.0°F on April 27th to 30.2°F on April 14th. Daily average temperatures ranged from 65.7°F on the 26th to 43.4°F on the 14th. The monthly precipitation total was 0.31 inches. 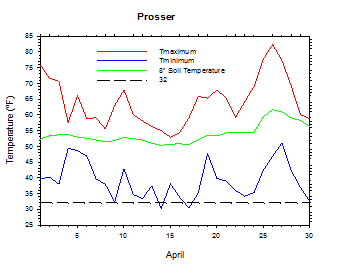 The average wind speed was 6.6 mph, and the average 8 inch soil temperature was 53.9°F. 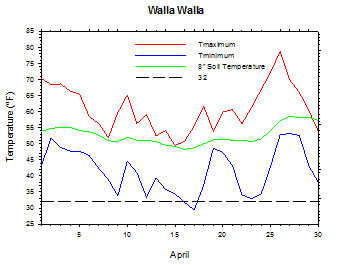 Wenatchee (WSU TFREC) recorded an average temperature of 52.0°F, which is 0.5 degrees above average, while Walla Walla's average monthly temperature of 51.2°F was nearly average. 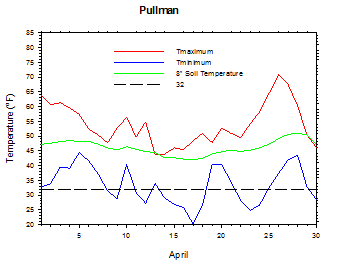 Pullman was one of the cooler spots in the state, with an average April temperature of 44.0°F. In western Washington, Mt. Vernon's average temperature was 48.6°F, which is slightly (0.2 degrees) below average. April 1st: The temperature at Desert Aire rose to 80 degrees. 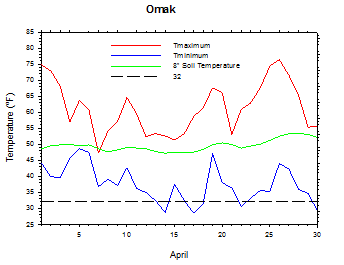 April 7th: The high temperature at Omak was only 48 degrees. April 13th: The wind gusted to 66 mph at Wenatchee Heights. 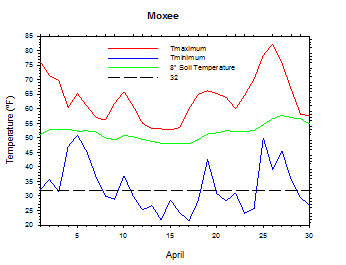 April 14th: The temperature at Moxee fell to 22 degrees. April 17th: The low temperature at LaCrosse plunged to 19 degrees. April 26th: The temperature at Desert Aire soared to 86 degrees. April 29th: The wind gusted to 52 mph at Huntsville. 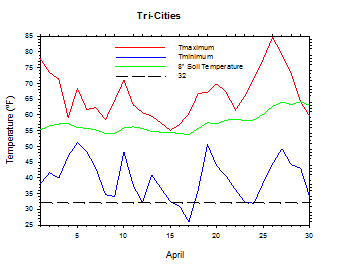 April 30th: The temperature at Ritzville plummeted to 22 degrees. 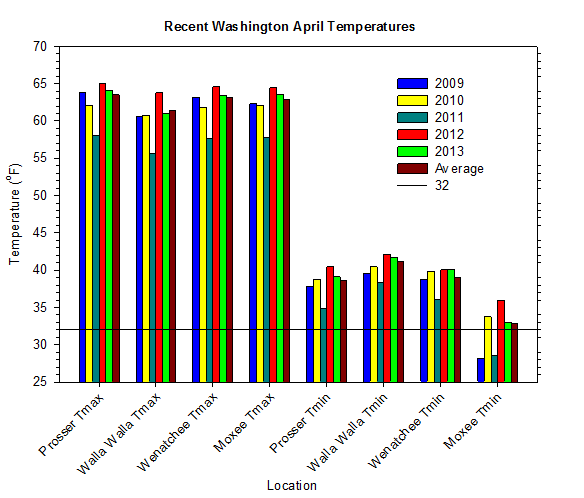 Despite its warm start, frost protection was necessary across Washington during several cold episodes in April. Significant cold damage was reported on cherries and apricots in Benton County, as well as on blooms at higher elevations away from the Gorge in Klickitat County. Pollination conditions were poor during mid April in Chelan County due to windy and unsettled weather. Stripe rust was also noted on wheat in the Benton-Franklin County region. In eastern Washington, reports from Adams and Lincoln Counties indicated that windy conditions made field work and spraying difficult during mid April. Walla Walla County reported cold damage on cherries and possibly beans and peas, while Columbia County reported cold damage on some fruit trees. In Thurston County, there were reports of infestations of silver spotted tiger moth on fir trees, as well as cold damage on berries. Despite a lack of damage, mid month crop conditions were poor in Pierce and southern King Counties due to cool and wet weather, although conditions improved by month's end. In Snohomish and Northern King Counties, there was concern of hail damage from storms during the unsettled middle part of April (National Agricultural Statistics Service)). On April 21, 2008, the temperature at Moxee dropped to a monthly record cold value of 15 degrees. According to the Climate Prediction Center (CPC), warmer and drier than average conditions are expected during May, and then near average temperatures and below average rainfall are expected during the summer and into the autumn season in Washington. ENSO Neutral conditions are forecast for the summer and early autumn time period, with large uncertainty thereafter regarding the possible development of El Niño or La Niña.